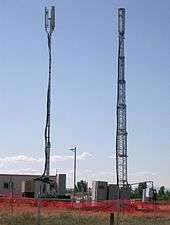 A T-Mobile cell site and base transceiver station in Marysville, Washington. 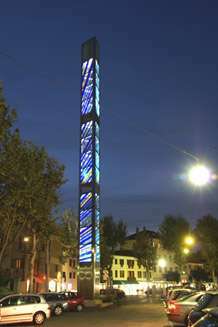 A mobile phone tower in Kangaroo Point, Queensland, painted for aircraft visibility. This 100 feet tall cross at Epiphany Lutheran Church, in Lake Worth, Florida, conceals equipment for T-Mobile. A cell site or cell tower is a cellular telephone site where antennae and electronic communications equipment are placed, typically on a radio mast, tower, or other raised structure, to create a cell (or adjacent cells) in a cellular network. The raised structure typically supports antennae and one or more sets of transmitter/receivers transceivers, digital signal processors, control electronics, a GPS receiver for timing (for CDMA2000/IS-95 or GSM systems), primary and backup electrical power sources, and sheltering. 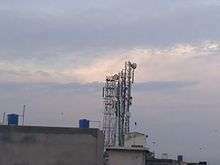 Some cities require that cell sites be inconspicuous, for example blended with the surrounding area, for example mounted on buildings or advertising towers. 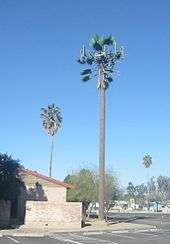 Preserved treescapes can often hide cell towers inside an artificial tree or preserved tree. These installations are generally referred to as concealed cell sites or stealth cell sites. In practice, cell sites are grouped in areas of high population density, with the most potential users. Cell phone traffic through a single site is limited by the base station's capacity; there is a finite number of calls or data traffic that a base station can handle at once. This limitation is another factor affecting the spacing of cell mast sites. In suburban areas, masts are commonly spaced 1–2 miles (2–3 km) apart and in dense urban areas, masts may be as close as ¼-½ mile (400–800 m) apart. The maximum range of a mast (where it is not limited by interference with other masts nearby) depends on the same circumstances. Some technologies, such as GSM, normally have a fixed maximum range of 35 kilometres (22 mi), which is imposed by technical limitations. CDMA and IDEN have no built-in limit, but the limiting factor is the ability of a low-powered personal cell phone to transmit back to the mast. As a rough guide, based on a tall mast and flat terrain, it is possible to get between 50 and 70 km (30–45 miles). When the terrain is hilly, the maximum distance can vary from as little as 5 kilometres (3.1 mi) to 8 kilometres (5.0 mi) due to encroachment of intermediate objects into the wide center fresnel zone of the signal. Depending on terrain and other circumstances, a GSM Tower can replace between 2 and 50 miles (80 km) of cabling for fixed wireless networks. Cindy Sage, co-editor of the Bioinitiative Report writes, " The WHO International Agency for Research on Cancer has just issued its decision that non-ionizing radiofrequency radiation is classified as a 2B (Possible) Carcinogen. This is the same category as DDT, lead, and engine exhaust. This mirrors the 2001 IARC finding that extremely low frequency (ELF-EMF) that classified as a 2B (Possible) Carcinogen. This pertained to power frequency (power line and appliance) non-ionizing radiation. These two findings confirm that non-ionizing radiation should be considered as a possible risk factor for cancers; and that new, biologically-based public safety standards are urgently needed. " Dr. Louis Slesin has been reporting on this issue for decades. 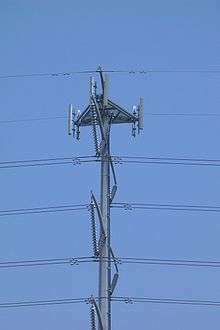 Cell site workers are called tower climbers or transmission tower workers. Transmission tower workers often work at heights of up to 1,500 feet, performing maintenance and repair work for cellular phone and other wireless communications companies. An off-grid cell site is not connected to the public electrical grid. Usually the system is off-the-grid because of difficult access or lack of infrastructure. An off-grid power system for a cellular site. Fuel cell or other backup power systems are added to critical cell sites to provide emergency power. More sites use internal-combustion-engine-driven generator sets. However, being less efficient than public power, they increase operating expense and are a source of pollution (atmospheric, acoustic, etc.) and some are in areas protected by environment and landscape conservation. There is often local opposition to new masts for reasons of safety and appearance. The latter is sometimes tackled by disguising the mast as something else, such as a flag pole, street lamp, or a tree (e.g. palm trees, pine trees, cypress..) or rooftop structures or urban features such as chimneys or panels. ↑ "Learn about what is on a cell tower: Without the Cat". Retrieved 9 December 2010. ↑ Frequently Asked PCS Questions undated, URL retrieved 14 August 2007. Archived 9 May 2006 at the Wayback Machine. ↑ NTIA Seeks Input on Broadband Stimulus Money undated, URL retrieved 3 March 2009. Archived 22 November 2009 at the Wayback Machine. ↑ Devlin Barrett (13 November 2014). "Americans' Cellphones Targeted in Secret U.S. Spy Program: Devices on Planes that Mimic Cellphone Towers Used to Target Criminals, but Also Sift Through Thousands of Other Phones". Wall Street Journal. Retrieved 14 November 2014. ↑ Kate Knibbs (13 November 2014). "WSJ: A Secret U.S. Spy Program Is Using Planes to Target Cell Phones". Gizmodo. Retrieved 14 November 2014. ↑ Ballard fuel cells to power telecom backup power units for motorola Archived 6 July 2011 at the Wayback Machine.